August Bank Holiday Weekend - And the rain came ! Well we can always be assured a bank holiday will bring challenges for the weather and this one was no exception. 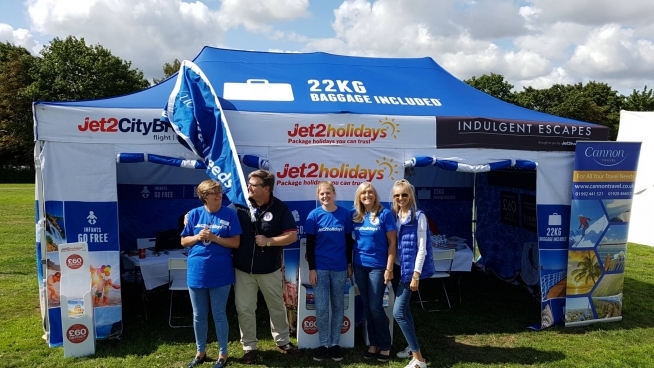 This August Bank Holiday members of the Cannon Travel team joined Daisy from Jet2Holidays for a weekend getting to know Harlow at the annual Linkfest and town Carnival. 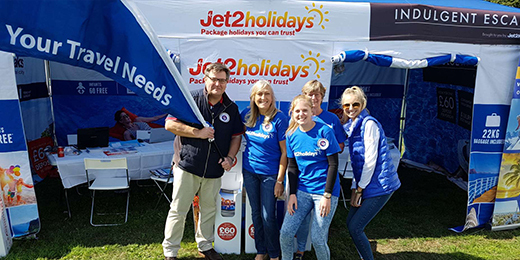 Spread over 2 days, the weather on Saturday was cool but dry and members of the team including: Sandra, Jean and Candice met some of the locals as they visited the festival and along with Daisy shared their passion for holidays and the range offered by Jet2Holidays from Stansted airport. As the day went on we looked at the forecast for Sunday with both anticipation and trepidation as the forecast was for heavy rain. As Sunday morning rolled around the day started dry but at 11am when the Festival started so did the rain. The skies opened and the rain came and carried on coming. 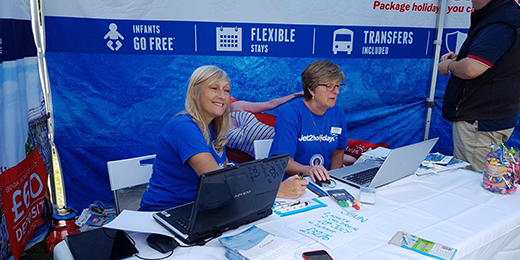 Lucky for the team we had a fantastic gazebo in which to take shelter and welcome any brave passers by to enter and find out more about Cannon Travel and Jet2Holidays. As the afternoon went on (so did the rain!!) the Harlow Carnival made its way into Town Park to join us at the Linkfest. Those in the parade whilst drenched from the rain put on a brave face as they entered the park. Old and young alike their spirits where high as they did their best to enjoy the day. As the parade reached the end of its route in the park, the majority of people, wet and tired made their way home. The moral of our weekend is that all good plans (and good events) are subject to the weather and this year the Bank Holiday weather wasn't on our side. 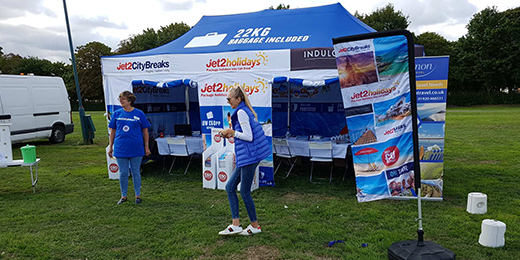 The Cannon Travel team and Daisy from Jet2Holidays did leave slightly disappointed not to have been able to share with more Harlow residents the great holidays available but there is always next year!! !